For such a popular holiday destination there is surprisingly little information out there on birding Italy, particularly during the summer (well, not the best time to bird, but us family guys are stuck with the holidays). Luckily there is a good guide available, “A Birdwatchers Guide to Italy” by Luciano Ruggieri & Igor Festari., which has lots of useful information. We went to Tuscany this summer, and stayed in two rather different parts of the province. The AA Tuscany Road Map is very useful. Most places have information centres with free maps and will tell you what you want to know. The Italian people are very friendly indeed, and a little basic Italian goes a long way. Driving was fine but for the very hairy roads in the northern hills. The holidays for most Italians start mid-way through August, so the beaches and roads weren’t as bad as we had feared. Italians make a real meal (sorry) about eating out. Be prepared for very long waits between your courses! The food is of course great. Supermarkets are open most days all day, except in the north when they close for Sunday afternoon. Cashpoints (bancomat) are in most places. Shops shut for the afternoon siesta in many towns, especially inland. It was very hot (30+) most days, but that’s why we went there. We flew from Leeds-Bradford Airport to Pisa with Jet2, an easy two hour flight. Our first week was in south Tuscany close to Campiglia Marittima, near Piombino. We stayed in a tourist let in the countryside one km south of Campiglia - “Giardini delle Fate”. This was very nice but we were plagued by no-see-ums or whatever the Italian equivalent is. Our boys got badly bitten and two of them required antibiotics after bad reactions to their bites! So put on the repellent every evening, because you don’t even realize you’re bitten until it’s too late. Most of our time was spent at the free beaches (the nature reserves south of San Vincenzo or at Sterpaia. We also had a day-trip inland to Saturnia, where we enjoyed the free hot springs swimming in the river. I mostly birded in the early morning and in the evening around our place. There was surprisingly a lot of activity early on, but by 8 am it was very quiet. Giardini delle Fate: our let had a very extensive back yard, with an olive orchard and a bit of scrub. I was most surprised to see five Hoopoes strutting around our back door one morning, but they turned out to be regular visitors. 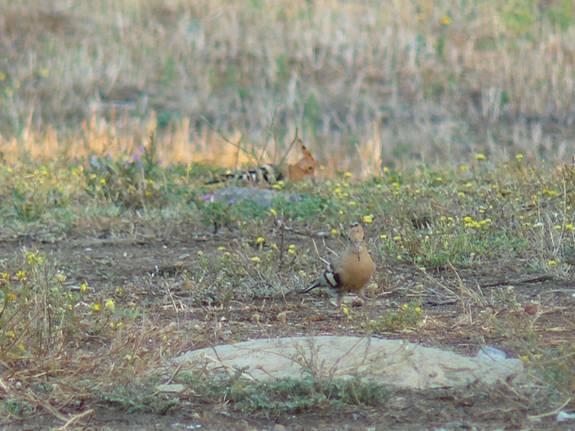 I also found Wryneck, Woodchat Shrike, Turtle Dove, Sardinian Warbler and Spotted Flycatcher in the immediate area. Walking along the road I also saw many Bee-eaters and a few Golden Orioles. I would guess these species are present in any suitable habitat. Campiglia Marritima: There wasn’t anywhere really accessible near our place (all private property), but I did find a quiet metalled road (Via dell’Annunziata) going out of Campiglia which had lots of good scrub. I managed to find a family of Subalpine Warblers here. 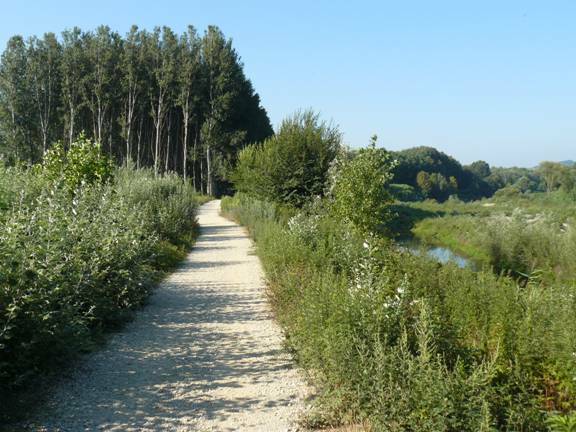 Sterpaia reserve (Parco della Sterpaia): This is a narrow wooded reserve that backs onto the beaches west of Follonica. In the baking afternoon sun I managed to find Tawny Pipit, Spotted Flycatcher, Nightingale and Western Orphean Warbler, but it was far too hot for proper birding. 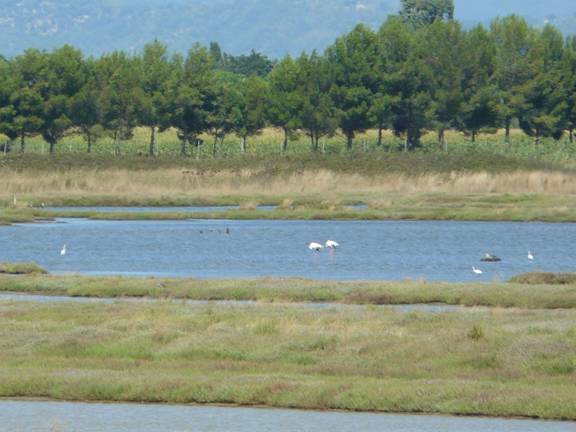 Orti-Bottagone: a WWF wetland reserve off the Piombino-Riotorto road. The Orti lagoon can be easily viewed from a side road to the west, rather than the busy main highway. Many egrets and three Flamingos were seen on a brief visit. 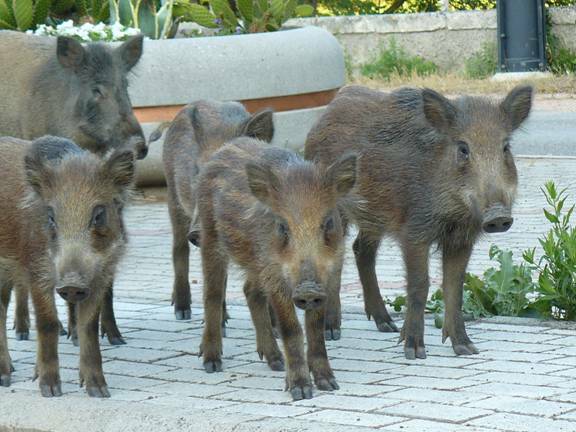 Parco di Montioni: no birds seen, but at Montioni hamlet in the middle of the forest there are tame wild boar being fed by the house-holders in the evenings. This was quite different in character from south Tuscany. We stayed in a villa (Villa Rosa) in San Cassiano, a few miles from Bagni di Lucca. This was well-wooded hill country, as opposed to the more Mediterranean olive/scrub landscape further south. The road up to the village was very narrow and had many hairpin bends. No little biting insects up here, instead we had small scorpions and large hornets to contend with! San Cassiano: our village was surrounded by trees, particularly sweet chestnuts. 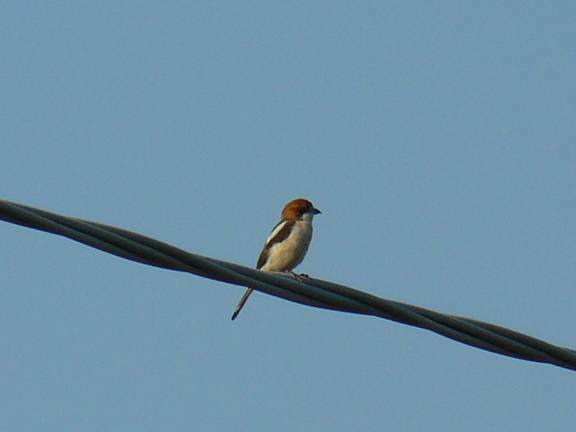 A Collared Flycatcher sang near our villa and eventually showed. Black Redstart and Serin were also present. A Short-toed Eagle did a regular flyby past our balcony at 5.15 every evening. Lucca: I asked Mark Hows for directions to the (exotic) Pekin Robin (Red-billed Leiothrix Leiothrix lutea) site near Lucca. Going out on the SS439 from Lucca to Viareggio, the road crosses the river Serchio. Park on the south side on the left side road. Walk west down the obvious path along the riverside. I found a Pekin Robin beyond the next bridge down in the scrub, where the habitat seemed better than between the first and second bridges. Squacco Heron and Kingfisher were also here. Lake Massaciuccoli: It was rather hot by the time I got here mid-morning after seeing the Pekin Robin. The LIPU reserve was not really obvious to me when I visited here (couldn’t find it – there doesn’t seem to be any directions on the internet either). I had a walk around some reed-beds just south of Massacciucoli, and saw Yellow-crowned Bishop Euplectes afer in flight. I also drove around the south side trying to get access but unsuccessfully. There are also many African girls here sitting under trees and waving you down. I wouldn’t stop unless you wish to avail yourself of their services. Orrido di Botri: Luciano Ruggieri advised me that breeding Wallcreeper could be found in this spectacular gorge. It is best accessed from the SS445 (Barga road), rather than the Montefegatesi road from the SS12 (Abetone road). Going up the gorge entails wearing crash-helmets (given out on-site) and going through water, so best to be prepared. The full walk is four hours return. We only managed half-an-hour due to family commitments, but it all looked pretty promising. The walk itself is good fun anyway. Golden Eagle are found further on near Mt. Rondinaio, if you can handle the drive. Subalpine Warbler - Campiglia Marittima; apparently the newly-split Moltoni’s Warbler is found further north, about Pisa - Florence. Thanks to Mark Hows and Luciano Ruggieri for their advice and help.